← The Abortion Factory Has Now ‘Manufactured’ 60 Million! Congressional Review Act Can Wipe Out ALL Obama Regulations – 8 Years Worth! After a pompous, liberal agenda was crammed down the throats of the American people during his first two years in office, President Obama suffered staggering losses in Congress for the next six years that cost Democrats control of both houses. 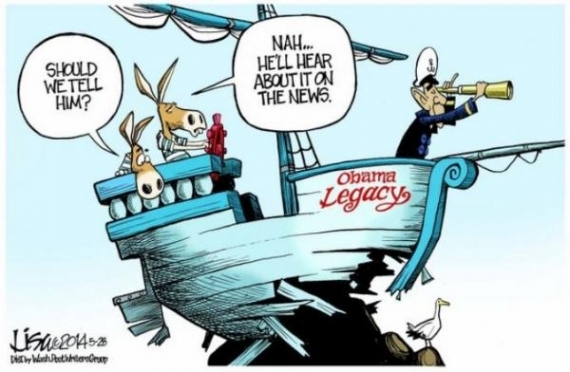 But, heavy Democrat losses, courtesy of an electorate that vehemently rejected a far-left agenda, didn’t stop Obama from continuing to push through countless new rules and regulations from the White House all while pushing his authority to the brink of every Constitutional boundary known to man. Of course, the problem with “legislating from the White House” is that all those rules and regulations can be undone by the next administration. And, as Kimberley Strassel points out in a Wall Street Journal Opinion piece today, a little know tool within the Congressional Review Act could allow Republicans to wipe out 8 full years of Obama’s liberal agenda, with a simple majority vote, all while preventing similar rules from every being recreated by future administrations. Todd Gaziano on Wednesday stepped into a meeting of free-market attorneys, think tankers and Republican congressional staff to unveil a big idea. By the time he stepped out, he had reset Washington’s regulatory battle lines. These days Mr. Gaziano is a senior fellow in constitutional law at the Pacific Legal Foundation. But in 1996 he was counsel to then-Republican Rep. David McIntosh. He was intimately involved in drafting and passing a bill Mr. McIntosh sponsored: the Congressional Review Act. No one knows the law better. Everyone right now is talking about the CRA, which gives Congress the ability, with simple majorities, to overrule regulations from the executive branch. Republicans are eager to use the law, and House Majority Leader Kevin McCarthy this week unveiled the first five Obama rules that his chamber intends to nix. Here’s how it works: It turns out that the first line of the CRA requires any federal agency promulgating a rule to submit a “report” on it to the House and Senate. The 60-day clock starts either when the rule is published or when Congress receives the report—whichever comes later. There’s more. It turns out the CRA has a expansive definition of what counts as a “rule”—and it isn’t limited to those published in the Federal Register. The CRA also applies to “guidance” that agencies issue. Think the Obama administration’s controversial guidance on transgender bathrooms in schools or on Title IX and campus sexual assault. It is highly unlikely agencies submitted reports to lawmakers on these actions.